I start my NXNE journey outside the Boat at 9:00 PM, only to find that the venue is at capacity for the opening set. The doorman is doing a hell of a job manning the gates against the horde of people who think they have a leg up on the others like me who stand patiently in line (kudos, dude). After Mother Mother finishes, some people leave and I was allowed in. So it begins. The Boat is a strange music venue. It's small, the stage is only a step up from the floor (no backstage either), and the whole place is nautically themed. Enter Les Breastfeeders, an act that thrives on crowd response--and the place is packed. Four songs in, the floor is shaking as their electrifying antics ignites the crowd. I think for a moment that the floor is destined to collapse, but Kensington Market is apparently built tougher than that. The amount of flash photography going on is insane... there's no need for a light show. Six songs in, the shirtless sweating man behind the drums (Fred Fortin) is scaring me. Toward the finale, Luc asks the photographers to clear out and make room for those who want to dance. The crowd responds in kind with a renewed surge of energy. It's over before I can make sense of it all, and my ears are ringing. Pride Tiger is up next, and they breeze through setup in record time. The set starts 5 min early, and though the crowd has thinned with Les Breastfeeders' departure, there's still a lot of buzz in the room. Pride Tiger's stage layout puts the drums up front and centre, and that says a lot about their music. They have a very old school sound that reminds me of several things simultaneously: a bit of Van Halen, some Zepp, perhaps a touch of Don Brewer from Grand Funk, and I occasionally picture explosions and dragons flying through the air. The dreaded guitar malfunction strikes at the third song, but the band doesn't miss a beat and the sound guys swoop in for a fix by the next song. Drummer/vocalist Matt Wood announces that they have a new album coming out on June 19 called "The Lucky Ones", then kicks into a track called "Fill Me In". It strikes me that their vocals are a bit weak at times, but they make up for it with some seriously tight musicianship that can get any body to start moving to the beat. The set ends and my ears are ringing even worse than before. Right on. The night shifts gears as drums and amps make way for turntables, drum machines, and laptops. I came to the Boat specifically to see Abdominal, and he did not disappoint! Armed with a toothpick and Nalgene bottle, he doesn't look like the typical gansta hip-hop artist... because he's not. Abdominal raps about fast food, being an ugly brother (compared to his sis), and at one point he even takes a (staged) phone call from David Miller asking him to play the unofficial Toronto anthem: T Ode. He follows that with a great rap about biking in Toronto, called Pedal Pusher. These are all tracks off "Escape from the Pigeon Hole," released earlier this year. 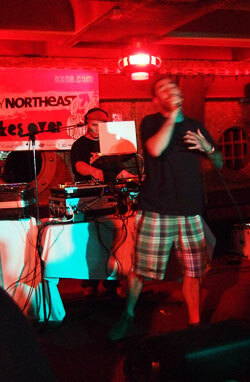 Toward the end of his set, Abdominal attempts a 16-bar verse in one breath. He only makes it to 11, but the crowd still cheers him on. Abdominal also mentions that he's opening for Kid Koala on June 29th at the Mod Club. The set ends and I'm debating whether to stay for Champion or risk the trip to Lee's to catch Ron Sexmith... go big or go home, I think to myself. While I did make it to catch Sexmith and Luke Doucet/Melissa McClelland, I'm running long on words here. Stay tuned for a review from another writer who was there! 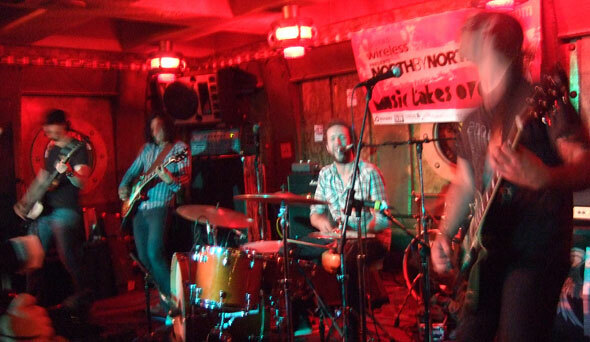 Also see, Hot Ticket: NXNE - BlogTO Style.